Over the weekend, Brian and I made our way to Mingo Creek Park. 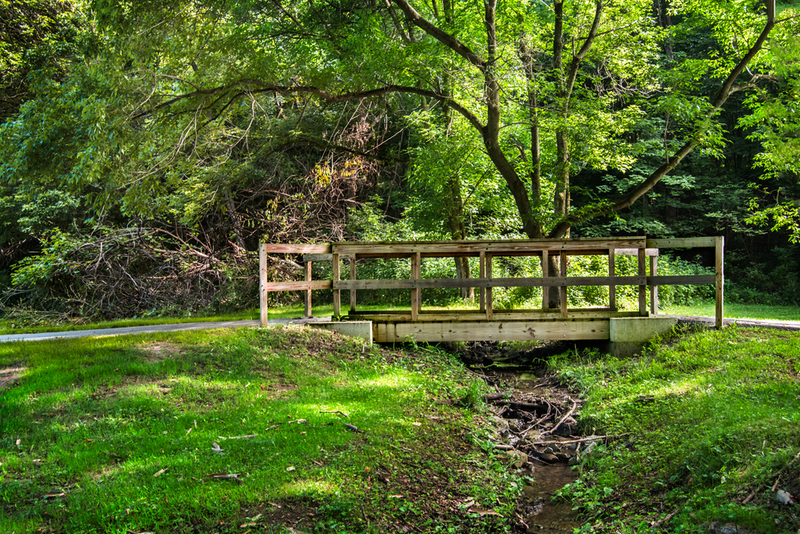 Mingo Creek is located in Finleyville, Pennsylvania. We didn’t get to experience much of the park because I wasn’t feeling well, and it had been a rough weekend. But, we tried to make the best out of where we did wander. When we arrived, we tried finding the red covered bridge that I had seen in photographs, but the maps online were not the best. So, we decided to just head out and see what we could find. It was hot out, but a beautiful day. We first stumbled upon a creek. As I was taking pictures I kicked off my shoes and stepped into the cool water to get the shots I wanted. It felt nice since it was hot out. The creek was very shallow, so the water only came up to my knees. As we walked on, we came across a couple of bridges, leading visitors to the opposite sides of the creek, or simply over a small watery area. The bridges were a beautiful rust red color and their reflections in the water complemented them even more. As we walked with the rest of our time, I stumbled upon some interesting insects and butterflies. We were introduced to a couple of dogs as well. It was very interesting to see four German Shepherds training as search dogs. They had to complete an obstacle where a family or single child hid in the woods or an open area and the dog was instructed to find them. It was nice to witness that. Even though we didn’t get to explore Mingo Creek that much, I hope to go back and visit there soon. Please enjoy these photographs that I captured from our walk there.